The battle of “cat vs. mouse” has been told countless times, through children’s stories to cartoon to video games. 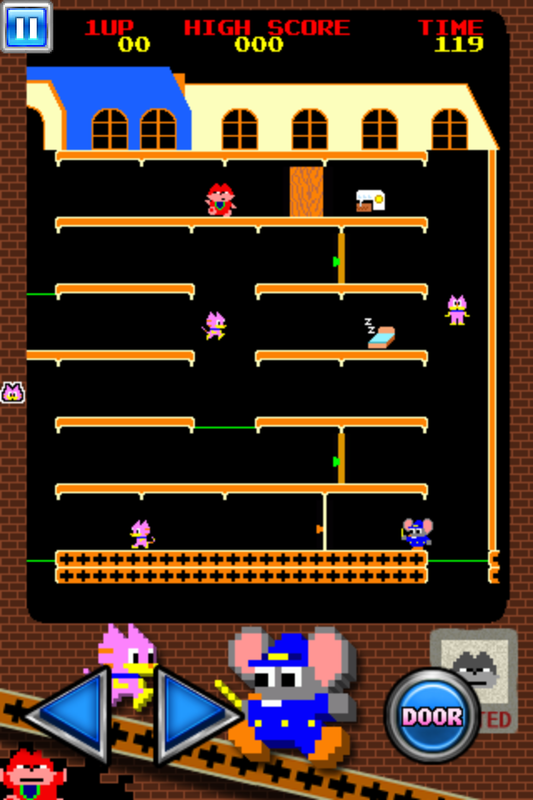 Mappy is Namco’s take on the formula, a 1983 arcade game that has some vague influence from Pac-Man, combined with some unique platforming elements. The game was designed by Eiji Sato, who later worked on Dragon Buster. 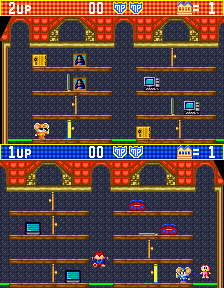 Each stage is divided into six floors, plus a “top” floor from where the enemies spawn. There is no jump button, so you can only hop between floors via trampolines scattered around the floor. There are also numerous doors scattered throughout the corridors. The only button in the game is used for opening and shutting these doors, in order to knock over bad guys or stop them from chasing you. 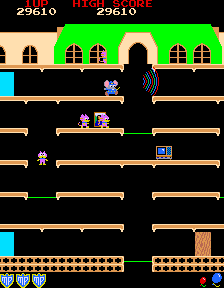 However, each level also has a handful of glowing “microwave” doors that, when opened, will send a wave across the floor, momentarily clearing the screen of any enemy cats in their path. 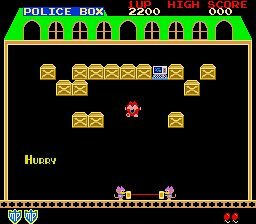 Like most of these type of enemy-chase games, the goal is to find the most efficient way to collect everything on the screen, while keeping track of all of the enemies and not getting stuck between them. 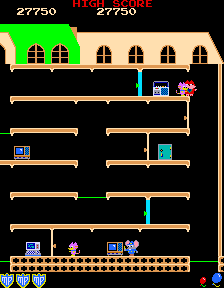 It’s a little bit difficult in Mappy‘s case, especially since the screen scrolls, so it’s impossible to see all enemies in the level at once. Furthermore, the arcade version uses a vertically oriented monitor, which limits your horizontal range of sight. 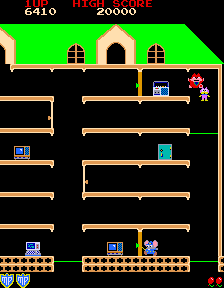 But avoiding enemies is just the tip of the strategy to play Mappy. There are two other major things to take into account – the periods of invulnerably, and the scoring system. 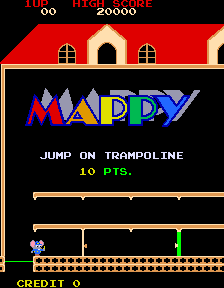 While Mappy is bouncing on trampolines, he is completely invincible – enemies just float right through him. (To counterbalance this, a trampoline can only bounce so many times in a row before it breaks.) The minute he sets foot on the ground, though, he’s fair game to the cats. 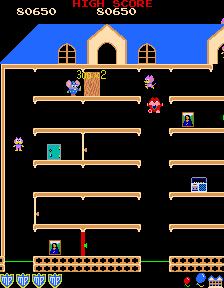 Using the doors is also important – if Mappy opens a door from the knob-side, he’ll be knocked back a short distance, but he’ll also plow through enemies and knock them down too, usually giving enough time for a quick escape. You actually don’t need to be right next to a door to open it – in fact, as long as you’re on the same platform, even several tiles away, you can still open or shut it. The cats can open doors on their own too, sometimes stunning themselves, though they cannot close them. There are a handful of tricks in the scoring system, which play off a risk/reward mechanic. All of the treasures are spread out in pairs. If you grab one, the other one begins to flash. If you manage to grab the flashing second item, you’ll increase the score multiplier, up to a multiple of five if you grab all items in pairs. Of course, grabbing the second item usually requires trekking all the way across the stage, which puts you in much greater danger. Some items are worth more than others, so if you grab then with a higher multiplier, you’ll be greatly rewarded. There’s a time limit to be aware of too, after which the enemies speed up and ghosts begin to haunt the level. The way you deal with foes also adds to the score. The more cats you hit simultaneously with a microwave, the higher the score. If you manage to snag Goro with the other cats, the point value will double. Additionally, Goro acts a little different from the other cats, and will occasionally hide behind treasures for a few seconds. If you snag the item while he’s behind it, you’ll get bonus points and remove him from the stage for a bit. On the other hand, if you misjudge the timing and he jumps out, there’s a good chance he’ll catch you. After every three stages, you’ll play a bonus stage. These levels consist entirely of trampolines, and you need to pop all of the balloons before the timer ends. The stages grow a bit more complex as you go through them. At first, the floors are divided up evenly, with trampolines every few steps, making it easy to run away from the cats. As they progress, the levels become more dynamic, with longer floors and fewer ways to travel between them. 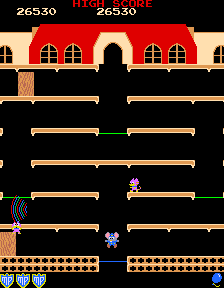 Later levels introduce other elements, like bells, which hang on the top-most floor of the stage and can be dropped on enemies, and rainbow floors, which dissipate once you’ve crossed over them. There are 16 unique stages, which repeat and get faster as you loop through them. Namco arcade games like Rally-X and Xevious, were some of the earliest to feature soundtracks, however simple. 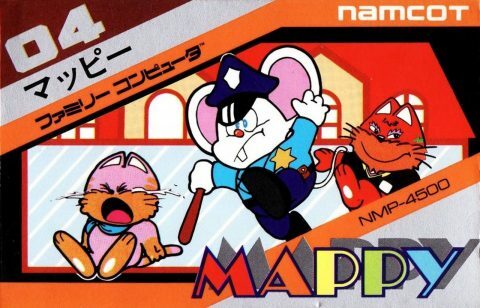 Other than the jingles, there are two theme songs in Mappy, the main theme and the bonus level, both composed by Nobuyuki Onoki. The upbeat main theme is particularly is incredibly catchy for a game from 1983. 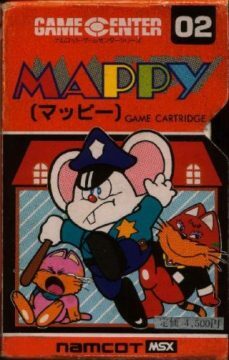 Mappy is also an adorable character, whose design was perfectly translated into his tiny sprite. His death animation, where he falls over and his eyeballs rattle, is amusingly comical. 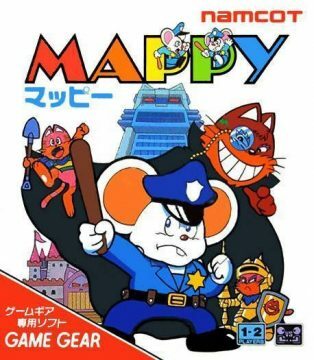 Mappy is an excellent game, one that took some familiar concepts, did something new with them, and added quite a bit of depth to the scoring and mechanics. While it was distributed widely in North America by Bally Midway, the game never quite caught on. It was much more successful in Japan, though even there, it didn’t quite have the lasting appeal that Namco had anticipated. In fact, in order to put some use out of the surplus arcade boards, Namco put together the legendarily infamous Tower of Druaga. 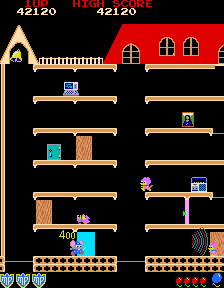 The game didn’t see release for American or European home computers, which perhaps hints at its lack of popularity, but it did receive numerous ports to Japanese home computers. None of the contemporary versions had the vertical resolution to feature all six floors, so cutting those down was typically the first compromise. Other issues include choppy scrolling and/or movement, flickering, and lower quality sprites. Most versions have music, suited to the computer’s particular sound hardware. Because of all of these changes, the movements of the enemies have been changed, and none are quite arcade faithful. Many of the computer versions were ported by Dempa. 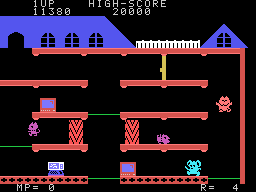 The PC6001 version is the simplest, with very low resolution graphics. The quality starts out lower with the X1 and FM7 versions, and gets better with the PC8001, PC8801, and PC9801 releases. There are actually two X1 releases, with the second release being significantly rewritten to enhance performance The Sord M5 version is fairly simple looking. 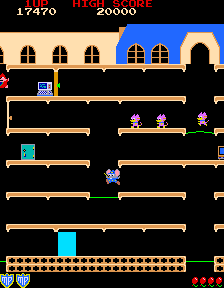 The MSX version is also fairly stark, though it’s one of the weaker ones just because it only features four floors, whereas most of the other ports have five. There’s a fanmade patch that brings this version up to MSX2 standards, primarily in having more detailed sprites, similar to the Famicom version. One of the most amusing ports is for the MZ-700 home computer. 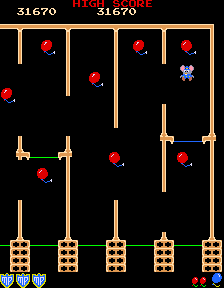 If a PCG board was attached to the computer, then it could generate simple graphics, a little lower quality than the MSX version. But without it, it couldn’t render sprites at all, resulting in all of the characters being rendered in colored text and symbols. 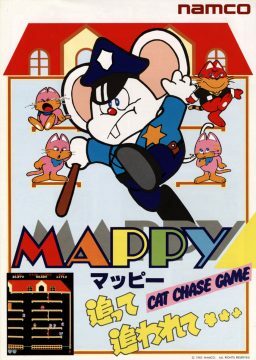 Mappy and the cats are two “o”s (for eyes) and triangles (for ears), while the score items literally just read “television” or “painting” in katakana. It’s pretty ridiculous looking, but considering the platform was never really meant to games, much less arcade ports, it’s a work of art, in a way. There’s actually a ROM hack of the Famicom version that replaces the graphics with the weird sprites of this version. The Famicom version is the best of the early ports, primarily because the scrolling and sprite movement is smoother than the computer releases, though it too only has five floors. The Game Gear version squishes everything down to fit on a portable screen, with five floors as well, but looks and plays great. This version has an exclusive battle mode for when two systems are linked with a cable. Here, both players complete on their own screens to rack up as high a score as possible. 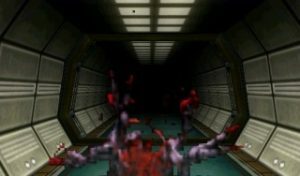 Though each plays on their own level and can’t directly interact with other, any defeated enemies are sent to the opponent’s screen to terrorize them. The Game Boy Color version commits the grievous sin of scrolling the screen vertically to fit more floors, rather than squeezing everything in like the Game Gear version, so it’s substantially inferior. Still, the borders for use with the Super Game Boy are fun. The Game Boy Advance Famicom Mini release is based on the Famicom version, of course. 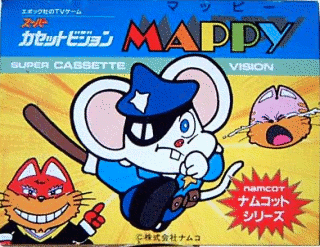 Mappy was never officially ported to the X68000, though there are two fanmade versions. These are better than all of the other ports (including the Famicom ones) because they run in a resolution that allows all six floors to fit on the screen. Both are similar, though the one labeled “Yopino”, released in 1988, has a slightly nice score display, and replaces the computers with systems that look like the X68000. 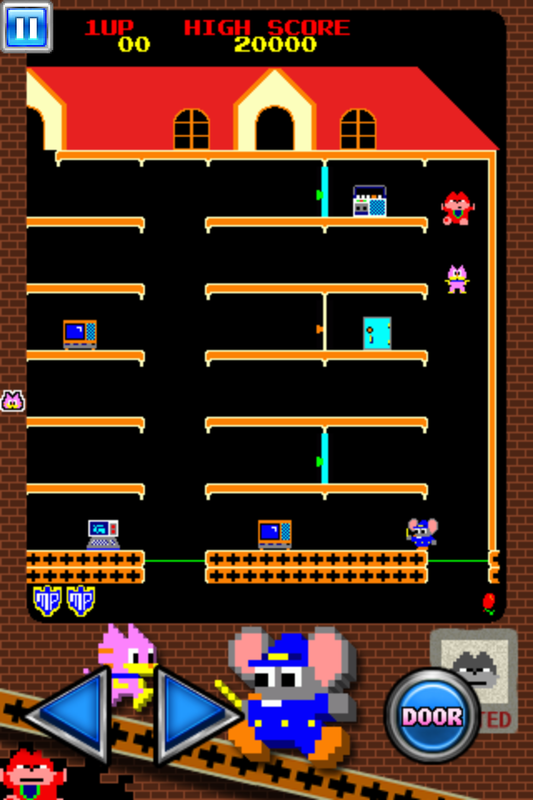 Like many of Namco’s classic arcade titles, the company created an arranged versions of the arcades (dubbed Mappy Arrangement, of course), bundled together on the same board with Galaga and Xevious. It’s a little unusual in that it’s primarily developed for two-players – the game is split in half horizontally, with the first player on the bottom and the second on the top. (In a nice touch, the second player, colored orange, wears a pair of aviator shades.) This means that the entire screen is squished into half of the regular playing field size. 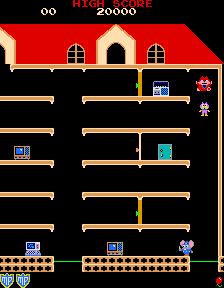 It has five floors (you can go into the attic from the first stage), but each floor is about the height of the sprites. It feels very squished, and a huge waste of place if you’re just playing single player. 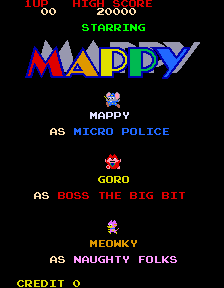 Compared to the other time Mappy had a multiplayer mode (the Game Gear version), here it’s more like “friendly competitive” – you’re both working to rid the screen of cats but you’re still trying to get all of the items before the other. Every level, the scenery changes to different backgrounds, with a boss fight against a large mechanical cat every few stages. Since there are no other offensive options, the only way to attack is by swinging the radioactive doors at the right time. Needless to say, it’s a poorly thought out addition. The balloon popping stages are back and this time they use the whole screen. They’re also vertically oriented, so you need to bounce upwards, rather than right to left. Though Namco ported many of their arranged versions to various compilations, this one stayed arcade exclusive, and for good reason – none of its additions are particularly well thought out, and is just another example of how the developers never really knew how to iterate on the original game. 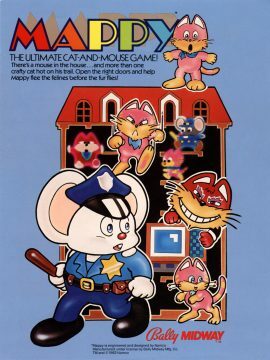 The only amusing aspect is a hidden mode that turns Mappy and the enemies from cartoonish anthropomorphs into realistic looking mice and cats. It’s surreal to watch them bounce around the levels, even though the proportions are much smaller and it’s hard to see much of anything. 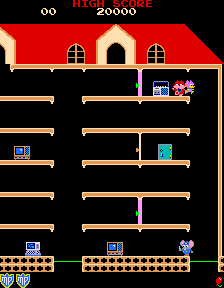 The game board also includes the original Mappy, which is basically the same as the 1983 arcade game, though with slightly different sound. 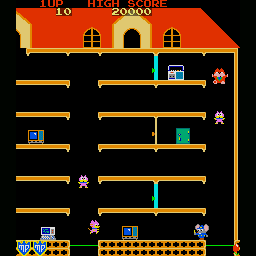 The first official near arcade perfect console port was released on the Namco Museum Vol. 2 for the PlayStation. This version lets you flip your TV to mimic the arcade orientation, or simply runs in a resolution that keeps the proper aspect ratio while adding a sidebar to the side of the screen. 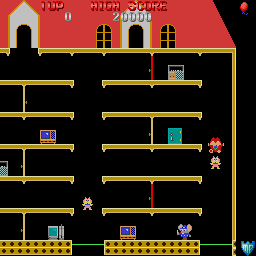 Most subsequent versions, like Namco Museum Virtual Arcade for the Xbox 360 and Namco Museum for the DS, are emulated like this. In 2006, there were four plug-and-play systems under the Let’s TV Play Classic line – two for Taito and two for Namco, each featuring two classic arcade games as well as arranged versions. Namco Nostalgia 1 includes Xevious and Mappy. 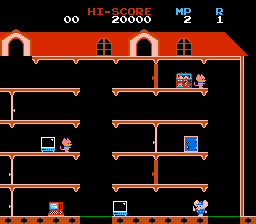 The port of Mappy is close to the arcade game, though only featuring five floors, and the music isn’t quite the same. 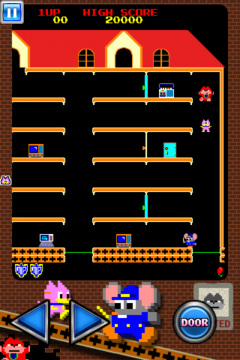 While all of these other games featured in this line included special variations of the arcade game, this one features an entirely different game, this one styled after Breakout. You control two Meowkies holding a trampoline, as Goro bounces around the top of the screen, breaking boxes and getting items. 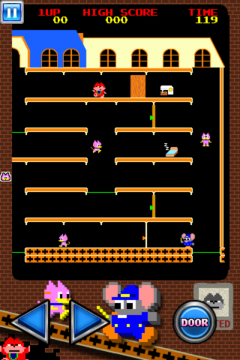 Mappy was also released on the iOS. This version includes slightly touched up visuals that round out the edges of the sprites, while still maintaining their low resolution, old school look. However, the frame rate is a little choppy. It also adds in little arrows so you can see the locations of any cats that are off screen. 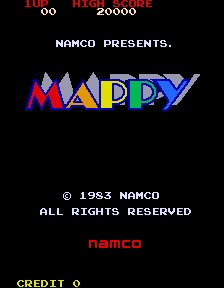 The title screen includes a fun piano rendition of the Mappy theme. This port also includes a new “Scramble” score attack mode, where you’re given 120 seconds to score as many points as possible. You technically have unlimited lives, though getting hit will stun you for a few moment while the timer counts down. All of the regular items have been replaced with different things, all of which have different effects – fish will cause the Meowkies to ignore Mappy for a few seconds, the hourglass will freeze all of the Meowkies, the sewing machine will sew the trampolines so they won’t break, and so forth. The items don’t activate in pairs anymore, though there are score multipliers for temporary score boosts. These power-ups will continually spawn around the level until time runs out. There are also trap doors in the floors in addition to the regular doors.